Everyone loves a good family holiday, a time to break away from the chores and responsibilities of daily life. But how has family holidays changed from when you were a kid? I know my family holidays as a child never had technology involved. There were no iPads to entertain the toddlers, or iPhones to plug the teenagers in because they don’t want to go for a hike. We actually never had a choice but now that we do, how easy is it to fall into those very habits in today’s society? Technology is all around us and we rely on it for so many different things. I know I am super guilty of this on my family holidays now with my own kids. We went to Centre Parcs for the very first time to get in the great outdoors and explore with our two tots in tow. There wasn’t a day that my iPhone wasn’t capturing our moments, videoing something and sharing them across social media or being used to find what restaurant was best for kids and activities to do the next day. I think I probably use technology every step of the way. Should I be doing this? Is it making our holiday better or worse? We purposely choose an outdoor exploring kind of holiday to do just that get outside away from technology. I have been actively trying to put technology away to focus on what we are experiencing and doing right in front of us. We have our memories and playing with the kids only makes those memories a hundred times better than hiding behind our devices. Who needs google maps if we get lost isn’t that an adventure on it’s own? I couldn’t believe the statistics above and how much technology really is relied on day in and day out by us all. Whether it’s for emails, social media, photos, music, games or more so many are referring to their devices on an hourly basis. I probably am one of those included in this stat if I am being completely honest. What will your kids remember of your family holidays? You jumping in the pool, cannonball style or you taking a photo of them swimming from the lounge chair? From a child’s perspective, I think they would prefer the cannonball, don’t you? Have you taken the Centre Parcs family holiday technology quiz? 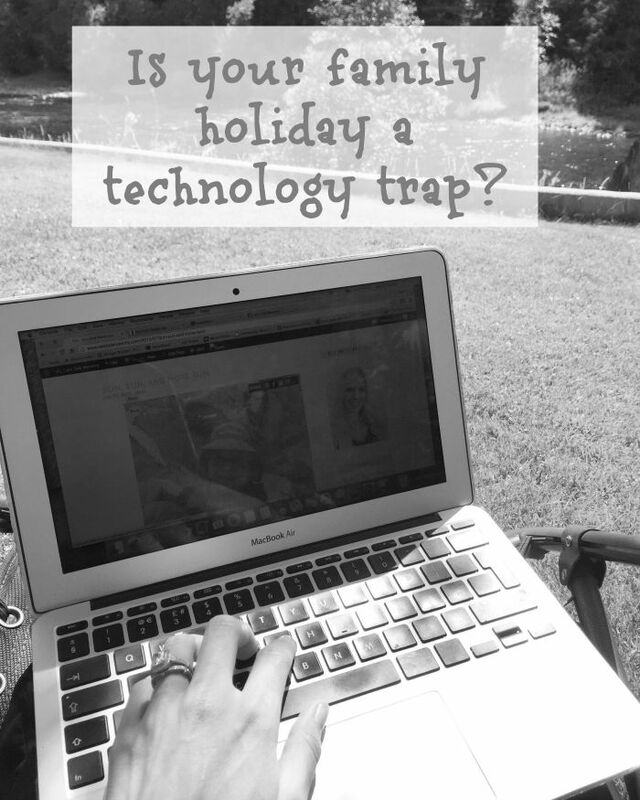 Take it here and share your results to see if you are in the family holiday technology trap like we are. Wow those are some unexpected stats. I know when we were away recently I was using my phone every day but it was mostly for maps and planning our route, I took much less part in social media than usual and it felt a bit strange at first!! It does feel so weird at first but I think as the trip goes on it feels better for it. I am the worse at it as I just like to share everything especially as my family all in the usa follow me so it feels like they are along for the journey with us but at the same time I always get the guilt that the kids may not see it that way and that I always have a phone in my hand is a bad role model for them. So as they are still young I am trying to break this habit.